While I’ve previously blogged about Umpleby’s Bakery and Cafe in Hanover, they’ve recently made a menu change that made it worth revisiting my review. In short, they’ve partly entered the world of burgers. Several minor happenings combined to make this happen. 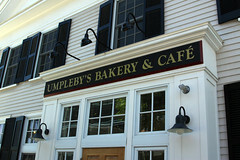 First, Umpleby’s has had a good relationship with Back Beyond Farm in Chelsea, VT for several years (if I recall correctly, that’s who supplies the sausage for their excellent sausage rolls). Charles Umpleby also read an article in New York Magazine about Pat La Frieda’s wholesale meat business that sells well-regarded hamburger meat to many pubs and restaurants in the city (you can read more about Pat La Frieda’s in a tour done by Nick Solares over at AHT) and wanted to try something similar. Finally, he’s already running a successful bakery and cafe that includes sandwiches, so it wasn’t a stretch to add a burger: the Umpleburger (great name, by the way). There are some limitations to the approach. 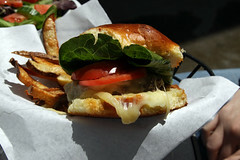 Right now the Umpleburger is a Thursday-only lunch special. And they don’t have a deep fryer, so they are doing oven fries instead of deep-fried french fries (more on that later, however). But on Thursday at lunch you can go in and order an Umpleburger and fries for $8.25 (or $8.75 with cheese, good meat has its price), and go grab a seat on the patio as they cook it up. 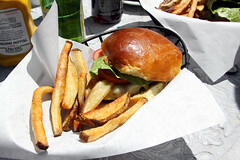 The burger is made with local, grass-fed beef, formed into a nice not-overpacked patty. The beef itself was flavorful and juicy, and served as a good foundation for a burger, but there were two places this could be improved. First, I’d really like to order my burgers medium rare. Sure, I know all about how various health codes encourage places to cook burgers at least medium, but I’m willing to put up with “undercooked meat” warnings and fine print acknowledging that my burger may be killing me, if it allows my burger meat not to get killed as well. It’s good meat coming from a good, local farm and not some meat-packing factory, we should be able to enjoy it that way. Next, the burger patty itself needs more of a sear on it. Between the “medium” cooking and the lack of a sear, my burger had more of a uniform soft gray texture throughout. Good flavor and juiciness, but we’re really missing the added crunch and taste that a good external sear provides. I’m willing to put up with a bit of overcooking of the burger if it gets me that good sear. Enough about what didn’t work, however. I don’t usually like brioche buns on burgers: the bun is usually a bit too sweet, and usually not the right texture (I’m not alone in this, my friends over at AHT have quite a few entries about good burgers getting held back by brioche). However, in the case of the Umpleburger, it actually seems to work rather well, with a solid crust, good absorption of meat juices (this is one place many brioche buns fall flat), and decent flavor that’s not overpowering the meat (indeed, I think this bun would be excellent with a few thick slabs of cold, rare roast beef). The fries, however, were outstanding. Lacking the deep-fryer, these are made in the oven, but using bacon fat left over from the bakery’s bacon preparation. The result is excellent oven fries, with a soft tender interior, a very crisp shell, and enough carryover flavor from the bacon fat that the fries were very flavorful. In the end, the Umpleburger was a good burger, but not a great burger. Nothing earthshaking, but it showed quite a bit of potential, and with a little bit of tweaking, could possibly be a winner. The too soft bun syndrome also plagues Ray's Hell Burgers here in Arlington. By the time the burger is half eaten the bun is a giant soggy mess.